On August 2nd 2014, I made my first ever trip to Trillium Brewing in Boston for the release of their Galaxy Dry Hopped Fort Point Pale Ale. I have to say, the employees are friendly, the beer is superb, and they can really move a retail line. When I got there, I'd say I was about the 20th-ish person in line, but I was in and out in less than 40 minutes. Other breweries, *cough* Hill Farmstead *cough* should take note. While there, I picked up a growler of today's brew: Melcher Street IPA. Pours not a completely hazy orange. I didn't get a sizeable head, but I can blame that on the teku glass I was using. Oh baby! Juicy, juicy hops on the aroma. A crisp bitterness too. It's like sticking your nose into a glass of Minute Maid orange juice, but with hops. A slight onion/garlic presence hidden deep in the back. I'm getting an acidic, fresh-squeezed orange juice on the first sip and the finish, while noticeably dry, is bitter hops. With such a dry, bitter finish you'd expect some of those hop flavors and resins to linger in an unpleasant way, but they don't at all. It When the last drop goes down, the finish is clean and your palate begs you for another sip. Melcher Street IPA is a full-bodied experience for the style. It is very crisp and juicy, but also hoppy at the same time. The drinkability is rather high. I am chugging away on my 32oz growler and have to remind myself to slow down. 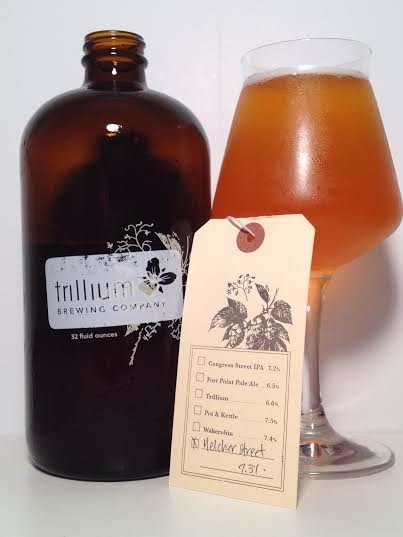 If you live near the Boston area, then Trillium needs to be a destination on your list. Excellent things are happening on Congress Street.